According to tradition St Ronan and his daughter St Lasair traveled from Monaghan in the 6th century and established a church here on the banks of Lough Meelagh. The present church dates from the 14th century, but the romanesque doorway on the south side may date from an earlier 12th century church. On the north side of the church is a crypt belonging to the McDermott Roe family. 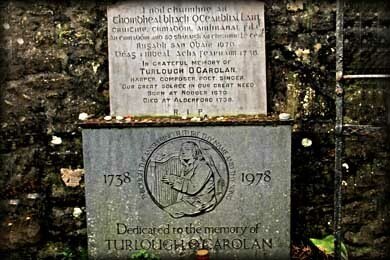 This is where the last of the Irish Bards Turlough Carolan is buried. 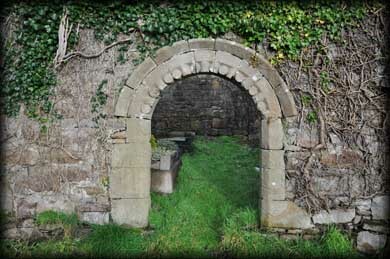 Across the road from the abbey on the shore of the lough is St Lasair's Holy Well. Situated: In Keadue, County Roscommon on the banks of lough Meelagh on the road to Kilronan Castle. Discovery Map 26: G 8990 1218. Last visit Dec 2011.